Episode 20 - The Pandavas range the Four Directions and conquer the world, bringing home mountains of treasure. Soon after, the Rajasuya Sacrifice commences. Krishna is given the top honor among the guests and this causes a tumult of disgruntled kings and nobles. They point out the problem that has become apparent in the story, which is that Krishna is a nobody in terms of societal ranking. He's a former cowherder from a caste of shudras who claims his father is a prince (alas, there were no witnesses to his alleged birth by Devaki). But even if he were not lying about his descent, he was still a noble of the 3rd tier, and from an insignificant backwater kingdom, where they had been forced to move by Jarasandh's armies. The general of that army, Sishupal of Chedi, was particularly outraged by this elevation of a milkman over the heads of all the kings of India. Sishupal had other grievances against Krishna, since his fiance Rukmini had been abducted by Krishna, his boss had been killed by Krishna's plan, and his friend and ally Rukmi had been killed by Krishna's brother. So Sishupal points out what should be obvious to us all-- that Krishna was a low-class cowherd, who boasted about killing a vulture and a cow, a woman, and an ox cart! Who said that these animals and the woman and the cart were demons? Furthermore, Krishna killed his own king-- a treasonous act of regicide that should be obhorred by anyone who desires law & order in society. Finally, Sishupal suggests that maybe Rukmini had already been used & put aside by himself before Krishna took her as his wife. That does it for Krishna. His killer frisbee comes flying and Sishupal is Beheaded. Check out that link, it's to the picture I mentioned in the podcast. It's pretty cool. This episode ends with a little vignette of Duryodhana wandering the Pandavas' palace and getting fooled by the illusions of the place. He falls into a pond and gets laughed at by his cousins. I've got more to say about how this scene gets changed over time, but we'll get into that in a later episode. i am a hindu and a brahmin by birth( though i dont beleive in caste system by birth and prefer division based on work or karma. i am listening to your podcasts and have reached upto king yayati. its excellent and your narration is very nice, it makes for religious, historical and critical review. during the swayamvara of draupadi, the fight broke up between assembled kings and arujuna in which the karna;s son from his wife vrushali was killed by arrow from arjuna. thats when karna took oath to kill arjun in battle. yadu the eldest son of yayati was cursed that they would loose their kshatriya characteristics. hence they would no longer remain kshatriya. So at the time of mahabharata thousand years later the other kshatriyas were not considering the yadava;s as kshatriyas and sometimes they used to not invite them for kshatriya only functions like swayamvara. example krishna not invited to swayamvara of rukhmini. Hello Ashutosh; I originally set out to bring this story to westerners who had never heard it before, so I'm very gratified to have earned the interest of South Asians who mostly know the story better than I do! As for the story of Karna's son being killed by an arrow at Draupadi's swayamvara-- where does this story come from? It certainly is not in the versions of the Mahabharata that I am working with-- the Bombay edition and the Pune Critical Edition. I've noticed that the BR Chopra series often includes apocryphal stories that appear in other versions of the Mahabharat or in the Puranas, but even that show does not include this detail about Karna's son. 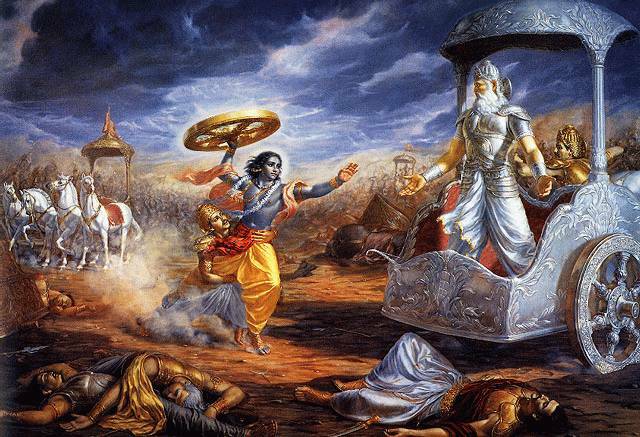 I've been satisfied with the explanations in the Mahabharata for Karna's resentment, which of course had to do with Arjun refusing to fight with him because of his questionable birth, and Draupadi's rejection of his courtship at her swayamvara for the same reason. I am a Software Engineer and normally quite busy in my daily schedule. The only time I get to relax is when I travel by company bus to and from the office to my home. Normally I used to listen to songs in this free time like anyone else but lately I have developed interest in Indian Mythology (since its always good to know your own ancestors). Reading from a book was a serious issue for me after sitting 9 to 10 hours before computer so I was searching a substitute to this pain. This is where your podcasts comes into picture. I found your podcasts very pleasant to listen with very clear description of each and every details. As compared to other podcasts out there I found yours much much better. I want to congratulate you on having put up such a great effort to study all versions of The Mahabharata and device them into such wonderful podcasts. I am a big fan of your podcasts and your narration. Keep up the good work man...God Bless You!!! !